OSB has changed a lot since it was introduced to the mass market more than 40 years ago. Here’s what you need to know to specify the right panels. OSB first burst onto the scene about 40 years ago as an affordable alternative to plywood. Versatile functionality, affordability, and resource efficiency helped OSB quickly become the leading residential structural panel product in the U.S.
And while OSB’s status as a go-to material hasn’t changed, many other things have. Thanks to continuous R&D, OSB sub-floor, wall and roof panels are available with an array of advanced performance capabilities, including options designed to stand up to Mother Nature’s worst. Here’s how OSB has evolved—and what it means for you. When stranded products were invented, they were called waferboard. OSB is in the same family and looks similar, but we’ve come a long way from wood chips and glues. OSB uses strands that are long and slender which allows them to be oriented in cross-directional layers within the panel. This creates both higher strength and stiffness while making a more dimensionally stable product. Resins and waxes continue to improve, helping to increase the panels’ dimensional stability, durability, and moisture resistance. The industry is also increasing its use of MDI resins, which are polyurethane resins that improve premium panels’ moisture resistance even further. Despite some misconceptions in the marketplace, OSB panels are not all the same. Using the processes and technologies described above, OSBhas evolved to include good-better-best options that allow you to select products that best suit your project needs and budget. For the sub-floor, for example, high-performance panels allow contractors to leave floor systems exposed longer. For higher-end flooring such as hardwood, these premium panels offer better fastener retention to ensure the finished floor looks good for longer. On the walls, builders can choose from a range of options to meet specific project needs and upgrade home performance, including long-length panels that can lower building costs and increase wall strength; fire-rated sheathing to meet fire code requirements without sacrificing design values; and radiant barrier sheathing that blocks radiant heat to reduce a home’s cooling costs. Another common misconception about OSB is that it will always swell if exposed to rain. While some commodity OSB panels are more prone to moisture absorption and therefore potential for swelling, mid-grade options are less likely to swell, and newer premium panels perform so well that they often carry no-sand warranties even when exposed to the elements for months. This breadth of options allows contractors to choose moisture performance based on application. For example, for a small production home where the house will be closed in quickly, a value-priced commodity sub-floor panel can be a good fit. For custom homes, which will likely be exposed longer and have high-end flooring on top, premium sub-floor panels are an ideal choice. 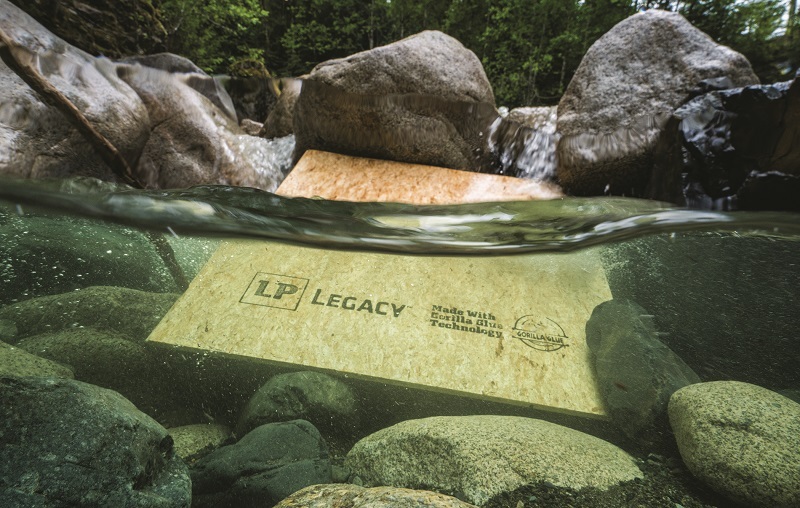 The moisture resistance of LP Legacy® engineered sub-flooring is so advanced that the panel carries a class-leading Covered Until It’s Covered™ no-sand warranty, as well as a Lifetime Limited Warranty that lasts as long as the home. Along with added moisture resistance, premium sub-floor panels offer tongue-and-groove installation with self-gapping, ensuring panels have the right amount of room to accommodate expansion and contraction. Some premium panels feature drainage channels to assist with removal of bulk water. Long a reliable option for sub-floors, walls, and roof sheathing, OSB’s advancing technology is ensuring the panels continue to play a vital role in homes across sizes, geographies, and budgets.